You are not logged in. [Log In] Mt Whitney Zone » Forums » » Reference » How long is the trail? #1972 - 08/21/06 10:48 AM How long is the trail? The two popular numbers mentioned are 10.7 and 11 miles. The reason for the difference has been discussed several times before, for example in Mile Markers. Of course, the original trail was built by Gustave Marsh in 1904, but it has been altered in many places. Eventually, around 50 years ago, things stabilized, and people refer to the then-current trail--carefully measured more than once at 10.7 miles long--as the "old" one. In 1977 the start from Whitney Portal was rerouted by the Inyo NF, adding 0.3 miles to the distance. Hence the quoted value of 11 miles now. Details are in that link above. But yesterday, as I was approaching the summit, I had the revelation that the true distance is longer than 11 miles. Surprised I didn't think of this earlier. The reason: The old trail has been lengthened, not only at the beginning but also at the end--by Sequoia NP this time. The details: A couple hundred yards after passing Keeler Needle, the old trail ascended straight up in about 20 short steep switchbacks. Next time up I'll try to get an accurate count. This section was always a bit of a killer, not only because of the steepness, but the elevation (now over 14,000'), and the fact that the day has already been long and hard. More recently, beginning just before the first steep switchback, the park service changed the trail. It now makes a single long, gently ascending, path to the west, followed by a sweeping switchback east once the summit plateau has been attained. It is obvious that the reason for the change was to make that last few hundred feet of elevation gain a lot less dreadful. I estimate from looking at it that the rerouting has lengthened the final part of the trail by about 0.2 miles. This also seems about right when measuring it on a topo map. So I'm going with the new total distance being 11.2 miles. Many of us still use this old section of trail. 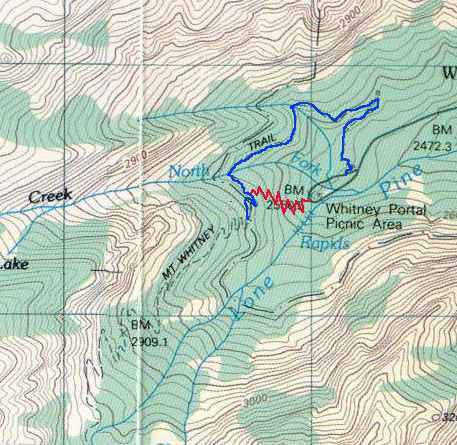 The first time we did Whitney in 2000, the trail seemed to abruptly end when you reached the summit plateau. Like everyone around us, we boulder scrambled straight up to the hut. It turned out that the continuation was covered by a rockslide. In 2001, knowing this fact, we crossed directly over the slide and picked up the trail again to the top. In 2002, the trail had been rebuilt to what it probably is today. The last time we were up was 2003. The first two time I did the MMWT was before the trail work in 1999-2000 and you had to climb rocks when you got to the Whitney massif, it was all marked with cairns. The first time I took a trail all the way to the summit way in 2002. You can still use the old trail which starts near the apex of road in the picnic area. Bob, if this is the trail you are talking about it does not seem .3 mi. shorter than the current configuration. I remember going up the switchbacks before the snowfield in 1999 and 2000 (I have pictures). After following cairns we eventually ran into what looked like a real trail further west (in fact we got lost going back down that trail in 1999 and ended up cutting back below the needles). In 2004, we followed the trail through the snowfield and up the normal switchbacks on the west side. While there may be shortcuts up the right side of the peak, the main trail cuts across the base (including a probable snowfield) and goes up on the left side of the peak. I tend to agree with webrtravis, the difference of the old and new trail at the bottom does not seem to be .3 miles. According to Paul Richins' book (Mount Whitney, The Complete Trailhead-to-Summit Hiking Guide) the new trail to the NF junction is 0.8 miles. This would have to be 60% longer than the old trail (0.5 mile). This in turn would mean the old trail must be 60% steeper, which to me does not seem to be the case. I just walked both trails last Saturday with my wife and two daughters (5 and 6 years). Could it be that the 0.3 miles difference accounts for the re-routings at the bottom and summit combined? I would have to get my Trig book out again but I am sure there is not a direct correlation between distance traveled and slope angle when comparing routes of different distances to the same destination. In other words, even though the distance is 60% longer the increase in percent grade or slope angle would be much less than that. If I gain a height h in travelling a horizontal distance d, the average slope is h/d. If I increase the distance by 60% but gain the same height, the ratio of the old slope to the new slope is 1.6 -- the old slope was 60% greater. See, I should have gotten my trig book out before I opened my mouth. Old is red, current is blue. The red switchbacks are just sketched in. The squares are one mile. The old trail is considerably steeper. Quoting from Hellweg and McDonald (who used a measuring wheel to establish the mileage figures in their 1990 book): "The old trail started off steep and narrow and was considered to be the worst part of the entire trip. But all that has changed. The new trail ascends gradually across a chaparral slope dominated by sagebrush, pinyon pine and manzanita. Instead of being the worst, this is now about the easiest section of the entire trip." In the 1950s Bob and Geri Lee of Ridgecrest used a surveyor's chain to measure the entire trail from bottom to top. I am pretty sure that the various mileage locations that H&M compare to are based on their measurements. The car-to-whatever-trailhead distance is pertinent. I was lucky enough to go there not only before there was a "new" trail, but also before there were parking restrictions. Many times I parked right next to where the "old" trail starts. Now, of course, you have to park farther away, and that about halves the 0.3 mile penalty. And they say a picture is worth only 1000 words! Thanks for the picture. Yes, I have used both trailheads and you have to go at least 0.1 mile farther on the road to get to the old trailhead. The only thing it saves you is three creek crossings. We used the old trail last year when the creeks were high. Note: From what I remember from the old trail, the switchbacks are closer to North Fork than you drew them. As I recall, there were several places where we could see/hear part of the North Fork cascades. Yeah, I didn't try to be accurate, just show the approximate beginning and end points. Here is a scan of my 1958 quad--not to the same scale as the one above, though. You can see where they place the trail. But this is not so accurate, either: I swear there are more than three switchbacks! You can see the "new" trail here, too. How is that? As I explained elsewhere, that is the trail that the pack trains used prior to 1977. You can't trust map details too much. Note that this old map doesn't show Carillon Creek at all. The new map has Carillon Creek, but not the pond. The "missing" stream crossing means that the trail start is shown too far to the right, or that Carillon Creek is misdrawn when it gets close to the Portal, or both. Probably both. This is an interesting discussion particularly when my memory considers the old trail the real one. It's like going up the old road to the Portal which was often one lane and dirt. My parents would have us look far ahead to see if a car was coming down (or going up) so that one or the other of us could find a spot to pull over. I still enjoy seeing the Lucy/Desi movie "The Long, Long Trailer" which shows a little bit of the old road. 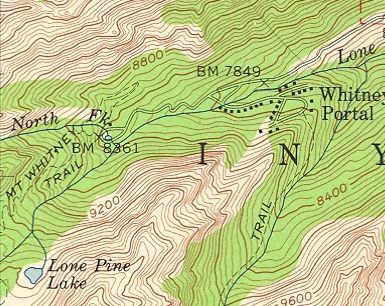 Bob's caption: "I started with Wayne Pyle's carefully created map, made a slight correction for the Mountaineer's Route trail (orange), and added some of the Main Trail shortcuts many of us take (lime)." Generated in 0.301 seconds in which 0.090 seconds were spent on a total of 13 queries. Zlib compression disabled.